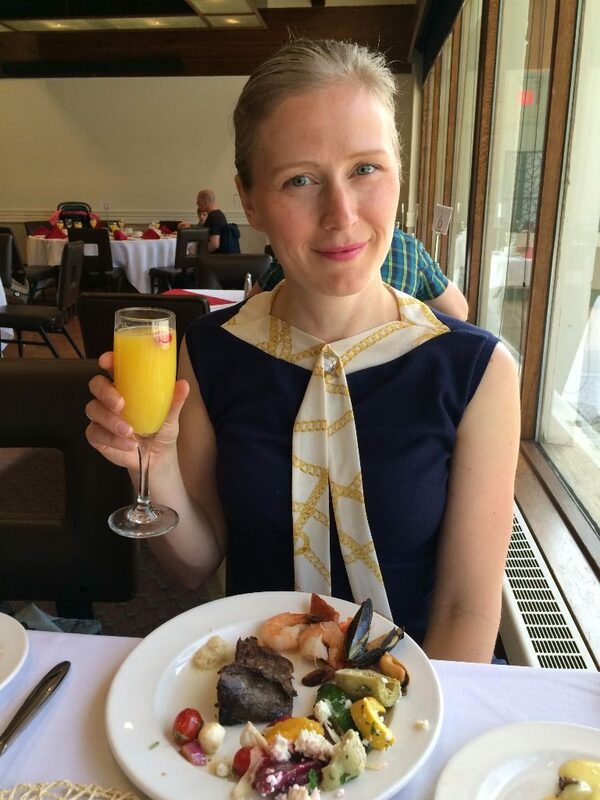 A new addition to the Sunday brunch scene in Edmonton is the Royal Glenora Club. Since Chef Steve Buzak took over as executive chef of the private member club, the door for non-members has slowly been opening to a number of social and dining events at the river-valley venue. I had the pleasure of working with Chef Buzak when he hosted a Swine & Dine for Alberta Pork back in March at the RGC. Chef Buzak invited me to check out their new brunch – open to members and non Royal Glenora Club members by reservation- but only until Father’s Day. The Spaniard and I visited the RGC for brunch this past Sunday where four seatings were available: 10:30am, 11:00am, 11:30am, and 12:30pm. We were seated in one of the upstairs ballrooms with a window view of the river and asked what we would like to drink. The Spaniard opted for a latte and apple juice while I couldn’t turn down the offer of a mimosa. Knowing that I am celiac, sous chef Pawanjit Singh greeted us at our table and offered to walk me through the buffet to identify the gluten-free options. We walked along a row of chaffing dishes filled with classic breakfast choices like roasted potatoes, bacon, and sausages which lead to more unique brunch options like wild mushroom and goat cheese Benedict, fresh herb marinated chicken breast, roasted leeks, red pepper coulis, and gremolata crusted salmon, shaved fennel, asparagus and mint essence. Chef Pawanjit offered to accommodate my dietary restriction. Not sure if he could tell I was a hollandaise addict, but he brought me a hearty portion of the wild mushroom and goat cheese benedict without the bun, as well as a crust-free gremolata salmon. Unsure where exactly to start with a buffet, we visited the build-your-own omelette station where Samira complimented us on our shrimp, shallot and mushroom combination before expertly flipping our omelette – and then packing it full of cheese for the two of us to share. While the Spaniard topped up at the french toast bar – I was more excited to visit the salads, small bites, and seafood section of the buffet. My weekend breakfast routine often includes pancakes and waffles and copious amounts of bacon, so if I go for brunch I like to indulge in things i’m less likely to have at home. I was really impressed with the choices of seafood – and was very happy when Chef Pawanjit sent out a gluten free wasabi crusted tuna with pineapple mango salsa. The atmosphere was very casual, and with no sense of urgency to get us in and out, I took on the challenge of cracking some crab legs. Tedious and just a little bit messy – it was definitely worth the effort. What is a buffet brunch without a bite of something sweet to finish the meal? There were a variety of options at the dessert station, from house-made cannoli to espresso panna cotta – but I showed restraint and had a white chocolate & raspberry crème brûlée. The Royal Glenora Club will have a brunch buffet available every Sunday until Father’s Day on Sunday June 19th, 2016. Call Member Services at 780-482-2371, or email the RGC at memberservices@royalglenora.com to book a table ahead of time. Amazing! I have been a member there for 35 years and have never experienced that! I am jealous of your brunch experience.